"THANK YOU! NOW I KNOW I WILL BE WHOLE AGAIN!" My husband and I were in a car accident in June of 2016. I had a fractured hip, fracture near my knee, knee reconstruction,and nerve damage in my leg causing my foot to have limited movement. 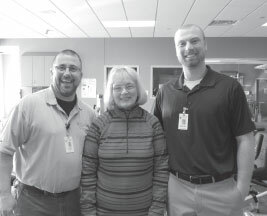 I started slowly with physical therapy in early November at Jefferson County Hospital in Fairfield, Iowa. As my therapy progressed my therapist, Matt Wickert, suggested that I start Astym therapy. He explained that David Kreuter, a therapist assistant certified in Astym treatment, would start the program to help the pain in my leg due to scar tissue.This treatment would help my numbness as well as my balance issues. A few days after the third Astym treatment, my balance has remarkably improved. I see steady improvement, where I don’t use a cane anymore and I can rise to a standing position without holding onto furniture. My fear of falling is gone. I am able to walk now with much improved mobility and the pain near the surgical site is almost gone. Thanks to the Astym therapy, I am getting my life back. Jefferson County Health Center has a phenomenal, well-trained staff. Though Robert Huebner has family who work in the medical field, he is an admitted “medical procrastinator.” Consequently, he was in serious condition by the time a recent illness sent him to the JCHC Emergency Room. But thanks to the life-saving efforts of Dr. 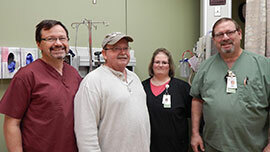 Goodwill and the ER team, Robert is now on the road to recovery. 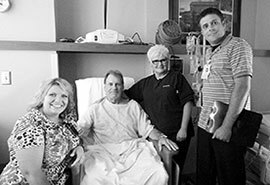 “A Small Town with a BIG – Great Hospital"
On November 20, Chris Johnson of Fairfield began to experience gastrointestinal bleeding while out of town. Fearing a long wait in a Des Moines hospital emergency room, he made the decision to travel back home to Jefferson County Health Center. Though the JCHC ER was busy that day, Dr. Goodwill and staff were able to examine Chris within fifteen minutes. The exam proved his condition was more serious than he had originally thought. “At the time, I was aware that I may die due to a great amount of blood loss. I was passing out when a mass of ER staff came to my rescue,” he says. Dr. Goodwill and his team immediately set in motion a streamlined course of action to save Chris’ life. Thank you JCHC for the correct diagnosis and the immediate treatment of my stroke. When time was of the essence they worked professionally and efficiently to get me the drug that preserved the quality of my life. Remember FAST. Facial drooping. Arm weakness. Speech difficulty. Time. "Thanks to all the experienced personnel at JCHC, my life is now back to normal"
My daughter Lori contacted the Jefferson County Health Center emergency room to let them know I was coming in. My good friend, Bill Moore, quickly came to my aid and drove me to the hospital. The JCHC emergency team of Amanda Campbell, RN, Bonnie McCarty RN, Becky Schwarz, CNA, and Dr. Derek Anderson were ready and waiting for me. The JCHC team was outstanding. They quickly assessed the situation and got me stabilized. They kept everyone informed as they prepared me for the helicopter ride to Mercy Hospital in Iowa City for immediate surgery. The time frame from the beginning of the event to coming out of surgery was only two and half hours. 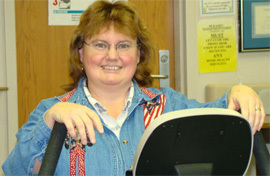 I recently completed 3 months of Cardiac Rehab at JCHC under the director of Marty Chandler, RN. Thanks to all the experienced personnel at JCHC, my life is now back to normal. "SOMETIMES 'THANK YOU' ISN’T ENOUGH"
I traveled from out of state to have my surgery at the Jefferson County Health Center by Dr. Gregory Ivins because of his expertise in orthopedic surgery. I really appreciated Dr. Ivins' honest communication about my surgery and possible outcome. My previous surgeon had not been as forthright. I have been in many hospitals and have had many surgeries but I have never experienced such exemplary treatment from every single person I came in contact with. I came into the Emergency Room on Thursday, June 9, 2011. I was having some chest pains. My heart stopped and the hospital staff and the ambulance staff were able to revive me. Thank you so much!! I eventually made it to Mercy Hospital in Iowa City where I had three stints put in my heart on Friday. They released me from the hospital on Sunday. 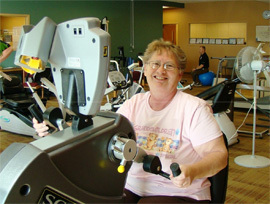 I am now home recovering and participating in cardiac rehab at JCHC three days a week. Thank you to everyone that helped me. Thanks again to everyone at JCHC and the ambulance service for saving my life. "I AM SO PROUD OF OUR HEALTH CENTEr"
A few weeks ago, I went to the JCHC Emergency Room. I left there with a great sense of pride. I was so proud of our hospital and the care they gave me and are able to give to our community. The caring, professional and competent manner in which I was treated removed all of my fear and any anxiety I might have been feeling. I was very well taken care of. Thank you JCHC emergency room team. "I AM SO GRATEFUL FOR THE CARE I RECEIVED AT THE JEFFERSON COUNTY HEALTH CENTER"
Thank you Dr. Ivins for allowing me to be active again. What a beautiful hospital! It didn't even look or feel like a hospital. Everyone there was a delight. The nurses and staff members' smiles had a way of making me feel better. My care was magnificent. The gardens are beautiful. I could walk down the beautiful long hallway and look out on tables with umbrellas. I was even able to take a walk out by the pond. The food was wonderful. I really liked the menu option and being able to choose what I wanted to eat. The hospital and my room were immaculate. 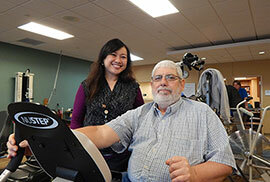 I looked forward to my daily Physical Therapy session with the wonderful therapy staff. I am very appreciative of the Occupational Therapy department and their suggestions on how to organize my home so that it will be easier and safer for me to get around. I was actually sad to go home. I will miss all of my new friends. "It's easy to understand why our hospital has consistently received the highest ratings for patient satisfaction"
Taking your child to the ER at 5:30 in the morning is scary. I was unfortunate to have to go to the ER one afternoon because of an accident, but fortunate that the staff that worked When we arrived at JCHC with our son, Alex, we weren't sure what was going to happen. Dr. Eisner in the ER, Dr. Ivins (Alex's surgeon), and the entire staff at the hospital were incredibly professional. They kept us informed at every step. They were constantly doing everything they could to make Alex comfortable and keep Ann and I calm. We were confident Alex was getting the best care possible. And, the new hospital provided such a comfortable and relaxing environment that you hardly realized you were in a hospital. We were overwhelmed by the kindness of the staff and their caring attitude. It's easy to understand why our hospital has consistently received the highest ratings for patient satisfaction. We are so grateful to have this wonderful facility in Fairfield with doctors and staff that truly care about the patient and their family. Thanks, JCHC, for your reassuring help in our time of need. The care and hospitality I received at the Jefferson County Health Center was exceptional. The time between diagnosis and surgery was only a few hours, which made pain and recovery time very manageable. The surgery went very well and the staff was constantly caring for me. My recovery was quick and I felt 100% within a matter two weeks. Every nurse I had was very polite and made sure I was as comfortable as I could be. The room I was placed in was very clean, pleasant, and friendly. All my guests made at least one comment on how great the rooms were. I would like to thank all of the staff at the JCHC for all the help I received and the fast recovery. - Alex Gookin, Sophomore at F.H.S. "THIS IS WHERE PEOPLE GET WELL"
I'm writing to express my great appreciation for the treatment my mother is receiving in your facility. Having only been in the lobby and meeting room, I had no inkling of the remarkable environment those who planned the facility, and the current staff, have created. Unlike all the other hospitals I’ve been in, where the feeling is, "this is where sick people are", after visiting my mom for this past week, my impression of Jefferson County Health Center is "this is where people are getting well". From the friendly and competent staff, to the obvious lack of "hospital smell", to the beautifully designed, lightfilled rooms, the entire environment seems conducive to the process of getting well. The planning that went into making this a sustainable and green building with a wellness orientation surely seems to have paid off handsomely. I also applaud you for focusing on wellness programs at the Health Center, and your involvement in the Jefferson County Wellness Action Coalition. All that speaks volumes to the healthy and intelligent orientation of the institution. "I WAS STUNNED AT WHAT GREAT CARE MY MOTHER RECEIVED"
Just wanted to send a note regarding the care my mother recently received during her stay at JCHC. I spent a considerable amount of time with her during her five day hospitalization. I have worked in the healthcare industry for 35 years and was absolutely STUNNED at what great care my mother received. The night she was admitted, she was exhausted and so was I, having driven down from Iowa City after working all day. The two nurses who admitted her (Pam and Jenny if I recall) made us both feel like we had just arrived at their own personal homes! They were so kind and upbeat and attended to mom's every need and THEN some ...! As the long days passed, and I was able to observe the entire staff, from the nurses to housekeeping to dietary to the doctor, I must say, it seemed like we were in Perfect Land! Everyone was so chipper and the staff was always interacting with one another, joking and being just plain happy! I was ESPECIALLY very very impressed with the staff's appearance: very neat, very clean, well dressed and professional looking. Trust me, I've seen the change in the appearance of healthcare staff over the decades and your staff excels highly in this area. And when your staff looks neat and clean, it emotes a feeling of personal cleanliness and even a higher respect for their capabilities. I was also impressed with the housekeeping staff, who looked and acted equally professionally. I was happy to see that someone was actually cleaning the door handles to the room (great idea!) and how spotless everyone was trying to keep her room and the whole hospital. 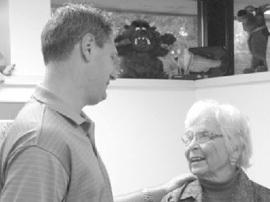 Lastly, it was amazing how nice the staff was to me and how they incorporated their care of me into their care of mom. They were always asking me if I needed anything!! My father was in the old hospital 12 years ago and there is no comparison to what JCHC has moved from and toward. Either you have an excellent way of interviewing and finding happy, positive people, or you have done a fantastic job in customer service training!!! I hope you will share my letter with your staff because THEY are the leaders that make your hospital great each and every day they come to work. Thanks for taking care of my mom-- she is doing GREAT! PS I especially appreciated all of the evaluating that PT and OT did before sending mom home....I had no clue whether to let her continue to live alone and their testing and recommendations were so helpful in assisting me in making a safe decision for Mom. "THANK YOU, THANK YOU, THANK YOU"
I am writing this letter in regards to my husband's stay in the ICU on January 11, 2010. I wanted to thank everyone who took part in his care. From the moment we walked into the Emergency Room, he received excellent care. The staff was caring, considerate and compassionate. They were more than willing to do whatever was within their power to make our stay as comfortable as possible. When we arrived on the floor, Elsbeth was his nurse. She was attentive and concerned about his comfort. When she asked if I was staying overnight, she promised a cot would be set up right in the room for my use. Betty McCarty was quick to set it up, leaving extra blankets for my use. Sara was charge nurse and was quick to see if there was anything that she could do for us. The night nurse too was very attentive. When Kenny said he was experiencing some pain from coughing and wanted some Tylenol or "something," she was quick to call and get an order to give some ibuprofen and a sleeping pill because he said he was tired but unable to sleep. The next morning, Desi was his nurse. She too was attentive, caring and concerned. When Desi had to go, Carla took over his care. She was very considerate, explaining that she was replacing Desi and was there anything she could do for us. I just want to express our thanks for the wonderful care that we received during this time of crisis for our family. It was nice to be so close to home and the kids while knowing that we weren’t compromising his care in any way. I was fortunate to already know most of the staff from being assigned a clinical rotation as a student nurse in summer 2009. I had been assigned there for winter term too. I already was impressed with the systems in place at JCHC. It was different being on the other side. However, it reinforced what I had experienced as a student working with the staff at your facility. There is nothing that any of the staff wouldn't do if it is within their power. Everyone was FANTASTIC. I can't thank everyone enough for everything they gave of themselves. It was not a good situation but everyone helped "cushion" the blow as much as possible. I would not hesitate to bring any member of my family to your hospital. When anyone asks, I will never hesitate to share our wonderful experience with them. My first day back to clinical after spending a week in Iowa City; everyone was so nice. Everyone asked "How’s your husband? Is there anything I can do for you? Do you need anything?" Ryan from RT was wonderful while we were inpatient. When we set up the sleep study and our insurance refused to pay for it, he has been wonderful in helping us find funding that will enable Kenny have the sleep studies needed and to get the CPAP he needs for his Cardiomyopathy. Equipment we otherwise would never be able to afford. Nancy thanks for listening, for letting me get teary eyed and for the hug. That was something that I hadn't gotten since the beginning of our saga that I obviously needed. Sincerity is something that you can't teach during an in-service. I can honestly say that each and every person we interacted with was sincere in their duties and their caring. Housekeeping even asked if there was anything she could get for us. And from having seen her in action as a student, I know that if I had told her "I'm cold" she would have gotten me a blanket. Thank you, thank you, thank you, everyone for everything, thank you. "I HAVE MY ZEST FOR LIFE BACK, THANK YOU"
I am writing this letter in regards to my husband's stay in the ICU on January 11, 2010. I wanted to thank everyone who took part in his care. From the moment we walked into the Emergency Room, he received excellent care. The staff was caring, considerate and compassionate. They were more than willing to do whatever was within their power to make our stay as comfortable as possible. Prior to surgery, any movement in my left arm was excruciating. I couldn’t even comb my hair. Then I was given the opportunity to meet JCHC Surgeon Dr. Gregory Ivins. It was determined that I needed surgery on my rotator cuff. He immediately put me at ease. I was impressed with his kindness, compassion and concern that I understand everything we were discussing about my surgery. 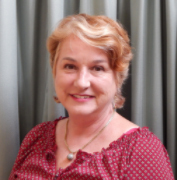 Dr. Ivins is blessed with knowledge and expert hands of a great healer. He is a tremendous addition to JCHC. We are lucky to have him in Fairfield along with the good people in the Physical Therapy department. Not only did I trust him with my health, now my son is going to have the same procedure done by Dr Ivins. "It Was like coming home"
I suffered a fall while I was out of state. After I transferred from another hospital to Jefferson County Health Center, it was like coming home. The staff greeted me with a smile, and from then on, I was treated with gentle, loving and professional care. They always answered the call light promptly and all of the nurses and aides were there for me. Not only are the nurses and aides empathetic, but the whole hospital cares. Administration came to insure all my needs were being met and the Physical and Occupational Therapy started me on the road to recovery. I also appreciated how the housekeeping staff kept my room neat and clean in a quiet and efficient manner. Two of the things which meant a lot to me were the quiet time from 1:00 pm to 2:00 pm when the hospital quieted down and gave me a chance to rest before my therapy and visitors, and that every room is private which is a great benefit. "THE CONVENIENCE OF HAVING TREATMENTS DONE LOCALLY"
As a small business owner in Fairfield and the main care giver for my mother, the convenience of being able to have her treatments done locally was wonderful. My mom was diagnosed with Non Hodgkin's lymphoma, a form of cancer treatable with chemotherapy. Surgery was not an option for her. Two weeks after she was diagnosed, chemo treatments began. Intense four to six hours of treatments took place at the Jefferson County Health Center’s Ambulatory Care Unit every three weeks. The comfort given to my mom during treatment was great. The care she received in all of the departments that included the Lab, Medical Arts, Ambulatory Care, the beautiful patient rooms and the Emergency Department was impeccable. I want to thank all of the physicians and the entire staff at JCHC. We are truly grateful to you and to her Oncologist Dr. Hazzi, for being in Fairfield so that my mother could receive her treatments close to home. "THEY WILL HELP YOU GET ON THE ROAD TO RECOVERY"
The Jefferson County Health Center has a wonderful group of people that will help you get on the road to recovery. I had a pin placed in my thumb joint and I didn’t think I would ever be able to use it again. The pain and swelling was terrible. 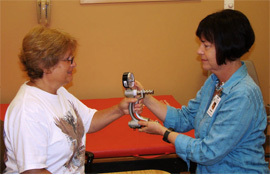 After working with Denise Gallagher, the Occupational Therapist in the Physical Therapy Department, I was able to do 80% of what I use to do. I knew this was the place I needed to be. I owe my recover to the OT Department and their awesome staff! 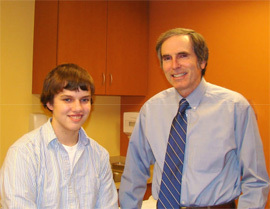 My son referred me to the Jefferson County Health Center Physical Therapy department because of his great experience. "DR. IVINS GAVE ME MY LIFE BACK"
My name is Jill Manley Leafgreen, and I am a native of Fairfield. Having lived here all my life and always having the Jefferson County Hospital and the services they provide, sometimes you take it for granted. Recently I had an Endoscope and a total knee replacement. I was overwhelmed by the quality of care and the professionalism that we have at our local hospital. Starting at the admissions desk with Bonnie Kessel's smile, the outpatient surgery staff preparing me for surgery and explaining my procedure while listening to my concerns. The Anesthesiologist also took time to personally explain things to me. They all made me feel safe, comfortable and very relaxed. In the operating room I was greeted with a warm smile and introductions of the people behind the masks and blue bonnets. The smile in the eyes of Cheryl Royer, Laura Cary and Joneane Parker all made me know I was in good hands. I can't say enough about how wonderful, professional and caring everyone was at the hospital. The nurses, CNA's were fantastic. From Serena Sherod to Harry Wood, day or night, the care was awesome. I began to feel like I was a friend, and not just a room number. I knew Physical Therapy for my knee was going to be difficult but Linda Coats, Marcia Holsinger and Bob Hipp made each step seem like a great triumph! Denise Gallagher and Karen Wesely in Occupational Therapy taught me easy and safe ways to do everyday things. Outpatient physical therapy is hard work but the staff made it fun. Lili Wells, Sara Boecker, Julie Aeschliman along with Lani Glass and Kay Steele encouraged and inspired me to keep trying. I am so glad I made the choice to come to my local hospital where people are highly trained professions who are caring and empathetic. We are so blessed in this area to have the services provided by Jefferson County Hospital from in-house mammograms, X-Ray, MRI's, blood work by the hospital lab and Endoscopic procedures. If you any health care needs check out JCHC first, they most likely have the services you need in a very professional and caring environment.